‘Mixtures and Alligations’ is about mixing different objects in order to get desired levels/percentage/concentration of different objects. As the dictionary meaning of Alligation (mixing) , we will deal with problems related to mixing of different compounds or quantities. The concept of alligation and weighted average are the same. Simple Mixture: When two different ingredients are mixed together, it is known as a simple mixture. Compound Mixture: When two or more simple mixtures are mixed together to form another mixture, it is known as a compound mixture. Alligation: Alligation is nothing but a faster technique of solving problems based on the weighted average situation as applied to the case of two groups being mixed together. The word ‘Alligation’ literally means ‘linking’. Example 1: If 100 ml water is mixed with 1000 ml of milk, what is the ratio of the mixture solution? This can also be read as milk solution 10 : 11, where if milk is 10, water is 1 and total solution is 11. Example 2: In what ratio should tea at the rate Rs 40/kg be mixed with tea at the rate Rs 27/kg, so that mixture may cost Rs 30 kg? So, the two should be mixed in the ratio . To find the mean value of a mixture when the prices of two or more ingredients, which are mixed together and the proportion in which they are mixed are given. 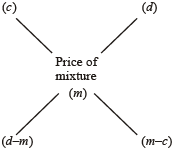 To find the proportion in which the ingredients at given prices must be mixed to produce a mixture at a given price. Example 3: In what proportion must sugar at Rs 13.40 per kg be mixed with sugar at Rs 13.65 per kg, so that the mixture be worth Rs 13.20 a kg? ∴ They must be mixed in the ratio 9 : 4. Example 4: 5 kg of rice of Rs. 6 per kg is mixed with 4 kg of rice to get a mixture costing Rs. 7 ker kg. Find the price of the costlier rice. Solution: Let the price of the costlier rice be Rs. x. Remember that in compound mixture, same mixtures i.e. mixtures of same ingredients are mixed together in different proportion to make a new mixture. Let Mixture 1 has ingredients A and B in ratio a : b and Mixture 2 has ingredients A and B in ratio x : y. (i) Let a vessel contains Q unit of mixture of ingredients A and B. From this, R unit of mixture is taken out and replaced by an equal amount of ingredient B only. (ii) Let a vessel contains Q unit of ingredient A only. From this R unit of ingredient A is taken out and replaced by an equal amount of ingredient B. Again let x kg of mixture is taken out of 8kg of mixture. ⇒ of the 8 kg mixture is taken out. Example 6: The ratio of water and milk in a 30 litres mixture is 7 : 3. Find the quantity of water to be added to the mixture in order to make this ratio 6 : 1. A mixture contains A and B in the ratio a : b. If x litres of B is added to the mixture, A and B become in the ratio a : c. Then the quantity of A in the mixture is given by and that of B is given by . Example 7: A mixture contains beer and soda in the ratio of 8 : 3. On adding 3 litres of soda, the ratio of beer to soda becomes 2 : 1 (i.e., 8 : 4) . Find the quantity of beer and soda in the mixture. and the quantity of soda in the mixture = = 9 litres.